No. 12A, Jalan Sungai Batu 11/KU6, Kawasan Perindustrian Sungai Puloh, 42100 Klang, Selangor, Malaysia. 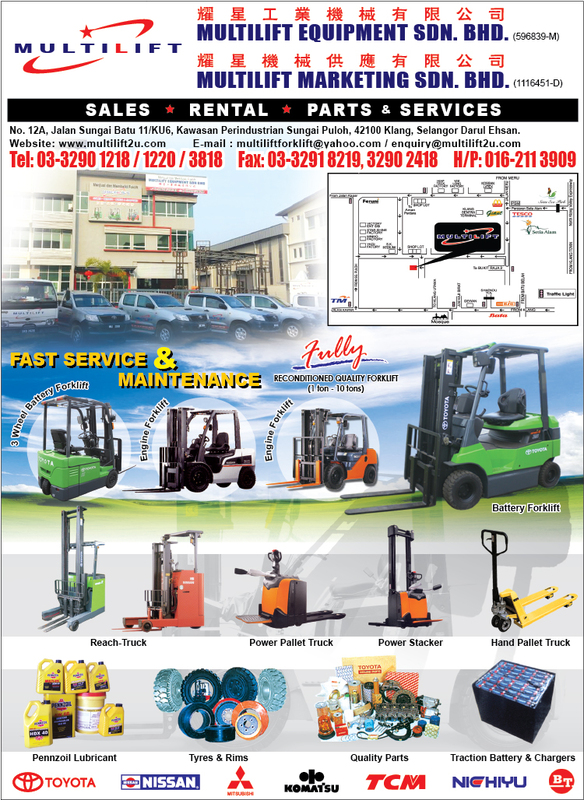 Multilift Equipment Sdn.Bhd was established in Malaysia in year 2002, Multilift Equipment S/B is best known in providing specialised Sales, Rental, Repair, Parts & Services of Material Handling Equipment: Forklift Truck, Battery Forklift, Engine Forklift, Reach Truck, Hand Pallet Forklift, Hand Pallet Truck, The Company has a wide variety of forklifts in terms of capacity, which ranges From 1 Ton to 10 Ton and the material handling equipment parts & accessories are Traction Battery & Chargers, Tyres & Rims, Pennzoil Lubricant & Quality Parts. Multilift Equipment is also a lead distributor for Toyota, Nissan, Mitsubishi, Komatsu TCM Corporate & Nichiyu. Our Company Culture - Efficiency, Professionalism and Reliability. To provide complete forklift solutions to our customers to help them tackle their problems with forklifts regarding its types and models. We are ready to assist them with our professional services to ensure continuous satisfaction from them as well as to fulfill both our commitment and responsibility towards them.